It was made in six weeks and cost under 3 million, becoming an unexpected success and the highest-grossing British film in history at the time, with worldwide box office in excess of $245.7 million, and receiving Academy Award nominations for Best Picture and Best Original Screenplay. In addition to this, Grant won the Golden Globe Award for Best Actor - Motion Picture Musical or Comedy and the BAFTA Award for Best Actor in a Leading Role, and the film also won the BAFTA Awards Best Film, Best Direction and Best Actress in a Supporting Role for Scott Thomas. The success of the film propelled Hugh Grant to international stardom, particularly in the United States. 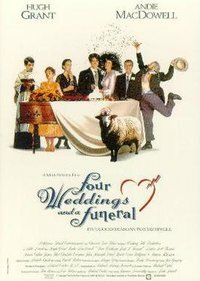 This webpage uses material from the Wikipedia article "Four_Weddings_and_a_Funeral" and is licensed under the GNU Free Documentation License. Reality TV World is not responsible for any errors or omissions the Wikipedia article may contain.